We welcome contributions with Green, Socialist (including Fabian), Social-Democratic, Left liberal, and Libertarian Left perspectives. Supportive and critical commentary are also welcome. (but no trolling) Please feel welcome to discuss the posts, or submit your own posts for consideration by the Moderator. The following article evaluates the debate on Carbon Tax reform in Australia, but also divisons between the Greens and ALP government on Company Tax and with the Minerals Resource Rent Tax (MRRT). Starting with a preference for distributive justice and social wage expansion, the author - Tristan Ewins - tries to chart some kind of way forward for the Gillard government and its allies. Debate on Company Tax cuts is beginning to gain momentum in Canberra with Gillard Labor, independents and the Greens at odds over what comprises the best policy. That debate is more broadly framed in the context of the Minerals Resource Rent Tax (MRRT), and a declared intent by Labor to direct new revenue into corporate tax cuts and infrastructure (especially in the ‘mining states’ of WA and Queensland), and in the process to provide room for an increase in superannuation contributions by business. Therefore it’s probably best to explain the background of the MRRT before going into the debates that hinge on the treatment of revenue thus gained - and how all this relates to the other crucial debate on Carbon Tax reform. The aim was to garner a fair share of profits from the sector for ordinary Australians who collectively own the non-renewable resources which the mining companies profit from. But elements of the mining industry spent an estimated $22 million on advertisements undermining Rudd Labor in an effort that effectively brought down a Prime Minister. Mining concerns would have remained viable and profitable. But the scare campaign: threatening disinvestment and job losses – found its mark. And the newer version will also only apply to coal and iron ore, excluding other minerals including gold, nickel and uranium. But the revised Minerals Resource Rent Tax will see a significant reduction in revenue compared to the original proposal. But there are potential issues for Labor in drifting away further from the platform it took on these issues to the 2010 Federal election. To begin: it is important for Labor to honour any agreements in order to retain credibility as a partner for negotiation into the future. This means that if Labor has any kind of ‘agreement’ it is a practical necessity at least that the government ought enter into fresh negotiations if seeking to change its position on resource taxation during the current term. Either that or take such action as to make the consequences ‘neutral’ for those concerned. This could boil down to a choice between either increases in corporate superannuation contributions for low income workers, or abandoning the Company Tax cut, diverting the proceeds to other crucial priorities as Brown suggests. Further: if the government goes down the path of increasing superannuation contributions for low income earners it would be best to also ease Aged Pension means tests for such groups to enhance any real effective gain. 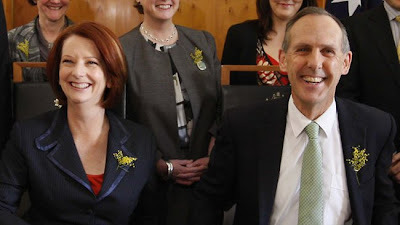 It is equally compelling as a matter of public interest, however, that the electorate be made aware of the scope of any agreement Gillard made with the big miners, including BHP and Rio Tinto, and corporate Australia more broadly, in the run up to the 2010 poll. Negotiations with the most powerful corporate interests ‘behind closed doors’ is anathema to democracy. Unfortunately, the political power of the miners, and the corporate sector more broadly, is not going to disappear any time soon, no matter how it skews democratic processes, overshadowing the voices of ordinary citizens. So maintaining credibility in negotiations with those interests is crucial no matter how problematic their power may be. However it is also most definitely legitimate for Labor to seek a fresh mandate at the next Federal election to effectively increase and widen the scope of the Minerals Resource Rent Tax; and to start canvassing support for any such move now. Given the past defeat, though, Labor would need to adopt a cautious approach. Yet there could be a difficulty with such a move as well if not handled properly. Labor might not want to ‘muddy the waters’ by pursuing too many distinct major debates on tax reform at once for fear of leaving some voters overwhelmed. But without putting public fears to rest – as early implementation could achieve – the debate may become a ‘running sore’ distracting from any further reform agenda. If the Gillard government could resolve the shape of Carbon Tax reform and see the tax implemented late this year (2011), though, fear and scepticism could be put to rest well before the next election. Crucially: this could provide the necessary time and ‘breathing room’ to pursue a debate on further significant progressive tax reform. Taking that into consideration, the tax ‘summit’ or ‘forum’ could do to be brought forward somewhat – perhaps by a couple of months. Openness to future reform is also crucial given the scenario of profit levels in the industry waning somewhat - to the point where the government will need to consider additional changes simply to maintain revenue, and fair returns on the natural resources that belong properly to all Australians. All this considered, what is the best move for Labor in pursuing social justice objectives, while fostering co-operation with its independent and Green partners? The key could be in the implementation of any Carbon Tax. Without some form of assistance exports and import-competing jobs might simply be lost overseas without any real reduction in emissions. Assuming these levels of revenue, it is the structure of compensation that is crucial: and which provides opportunities for fairer wealth distribution. Firstly, compensation should take the form of direct payments for low and middle income groups, and increases in welfare – including the Aged Pension, Disability Support Pension, Austudy and Newstart. Income tax cuts, by comparison, are a clumsy instrument which would compensate high income groups who do not need the assistance. Secondly: Compensation should exclude the top 30%-35% income demographic to provide sufficient scope to increase welfare and significantly improve the final financial position of low and middle income groups and individuals. Thirdly: In this context - by returning all such revenue gained via a carbon tax taxpayers in the form of cash payments to low and middle income groups, including welfare recipients, Labor could actually expand and consolidate its electoral support base. This could very effectively undercut Abbott’s appeal to ‘battlers’ on ‘cost-of-living’ issues. Fourth: A carbon tax rate at what Labor considers ‘the upper end’ of the scale (including the Garnaut proposal) could actually provide greater scope to assist low and middle income groups via compensation and effective redistribution. Hence it makes electoral sense in shoring up Labor’s support base. As for right-wing commentators such as Miranda Devine who seem to think distributive justice measures via tax comprise some malign ‘social engineering’: do they suppose the same is true in the case of most tax 'reforms' – including the gradual ‘flattening’ of income tax – which historically have redistributed wealth from low and middle income groups to the wealthy? The double-standards are palpable. This leaves us with the concerns of Bob Brown and the Greens more broadly that emphasis on Company Tax cuts will leave crucial areas of the welfare state and social wage under-funded and exposed. While Labor cannot be seen to be simply ‘dancing to the Greens’ tune’, minority government necessarily involves compromise. And indeed, given their significant electoral support base, the positions of the Greens ought be considered seriously regardless. As already alluded to – early implementation of a carbon tax could provide ‘breathing room’ for further debate and further reform before the next election. Dividend imputation is meant to stop so-called ‘double taxation’ of profits: providing credits to shareholders to compenstate for Company Tax already paid. This was supposed to provide an incentive for investment. But the reform – first implemented under Keating Labor – provided a windfall for the most wealthy Australians, with a massive cost to the budget bottom line, and less money for crucial social programs and infrastructure. Without fully removing the measure, shifting to half dividend imputation – as once suggested by progressive economist John Quiggin - would be a substantial equity measure, and provide over $10 billion/year much of which could be directed to crucial social programs in aged care, mental health and education, and for social housing and infrastructure. Such reform would mainly hit millionaires who own so much invested wealth in this country: but small investors may resent the change as well. The benefit from social investment would need to be clear before the next Federal election. And while a means test could provide fairness to small investors, using some of the money to further improve the Aged Pension could be a smart move in the context of ‘winning over' such people as well. Furthermore: to maintain investment in the Australian economy in that context, some of the money could be diverted to a public pension fund. (to be invested locally) Not only could this support ongoing job creation: it could also sustain the Aged Pension in the context of an ageing population. A compromise between the Greens, independents and Labor – with early implementation of a Carbon Tax, and a trade-off for half-dividend imputation in return for agreement on Company Tax – could be in the interests of Labor’s core constituency. Appealing to the material interests of most voters, it would also consolidate Labor’s electoral support base, while being well in keeping with Labor ideals. AND FINALLY: If you found this article interesting PLS join our Facebook group - to link up with other readers, and to receive regular updates on new material. It all really comes down to. If we accept that having a carbon tax and that will help cut emissions that are harming out atmosphere, will it really be enough to help, to slow down, Climate Change. Also if other countries are doing little or nothing at all. Then personally I feel, the Carbon Tax will do little or nothing, to Help. Trees are still being felled at acres, each day in the Amazon. Personally, I feel that it is too little, too late. It may be too little too late but pessimism won’t get us anywhere. A carbon tax is a desperately needed start. Don’t let Australia linger as a climate laggard any longer. A carbon tax is a great big new opportunity. This gives a workable plan of how we can move to renewable clean energy in ten years at the cost of $8 per week to households. 3. All products that use less energy in their production will become comparatively cheaper after the tax. Locally produced food, lightly packaged products, products that don’t use aluminium, organics that use less fertiliser, durable rather than disposable. This will spur innovation in industry to develop products that use less energy in their making. 4. Carbon farming to sequester carbon in soils through using lighter grazing regimes could be rewarded with proceeds from the tax. This has the potential to draw excess CO2 down from the atmosphere. Once again innovation that is now unimaginable is just around the corner with new financial incentives that the tax could make available to landowners. We are imaginative. We are clever. We can make this transition for our own and the worlds benefit. Curious to know if the carbon tax will be imposted on exported coal? "small investors may resent the change (half imputation) as well." Indeed. A far more equitable approach is to bring back the top marginal rate threshold to an appropriate income level such as $100,000 or less and also raising the top marginal tax rate. Some will say that this will encourage yet more negative gearing on property but there is no reason why negative gearing losses must be be fully deductible immediately or indeed deductible against other income at all. Negative gearing has never created one iota of land which makes up the vast majority of the cost of rental property. Any half-rational property investor doesn't build new buildings. He's more interested in property with a high ratio of land value to building value so the main effect of negative gearing is to bid-up the price of property with existing buildings. So negative gearing doesn't increase the supply of housing much at all. Half imputation is a scatter-gun approach with a lot of collateral damage. There are far more equitable and substantial alternatives. Again I do concede that without compensatory measures small investors would be 'caught in the net' by Half Dividend Imputation. I'm certain these comprise only a small proportion of invested wealth; so the overall social gain for ordinary Australians would be significant. But for the small number of genuine small investors it would not seem fair without appropriate compensation. Perhaps there could be an *assets test* providing exception for small investors? We do this elsewhere (eg: pensions, concessions) - so why not here also? I also don't know how much revenue reform of income tax as Chris suggests would bring in. I wish modelling about options for progressive tax reform was more readily available. But I definitely agree in principle with progressive reform of income tax, including thresholds and rates. My own ambition is to progressively expand social expenditure by 1%-1.5% of GDP for every term of Labor government. But this requires real commitment of new resources. Julia Gillard's emphasis in a speech the other day on avoiding 'big government' and 'big welfare' is part of the problem. We already have 'small government' compared with other advanced capitalist countries already; and our unemployment benefits are measly compared with comparable countries also. And social investment - including infrastructure needed for the broader economy - is not going to 'come from nowhere'. There are problems that can only be solved by 'bigger government' no matter what the neo-liberal ideologues think. Gillard opposes euthanasia (which I also think could be abused) But what about actually improving the living standards of Australians in Aged Care? (mandatory air conditioning; more staff; provision of gardens; maybe even internet access) An ageing population will mean we need 'bigger government' just to 'tread water' in social services and welfare. This requires social investment! As would increasing the wages of women workers (and men) in the sector as demanded (rightly) by unions. So - and I know I'm on something of a tangent - With bigger government and tax reform, where's the money coming from Julia? Or are we just going to 'cop out' on some of the biggest social problems of our time?
" I'm certain these comprise only a small proportion of invested wealth"
The vast majority of small investors invest through their super funds. Have you remembered these? "some may be consider them unwieldly... Yet the revenue gained - around $10 billion - would be well worth it..."
Where do you get $10 billion from? According to Taxation Statistics 2008-09, the total franking credits received by individuals was $3.192 billion. Half of that would be $1.596 billion. "Perhaps there could be an *assets test* providing exception for small investors? We do this elsewhere (eg: pensions, concessions) - so why not here also?" I remember the trouble the government had to go to to bring in the assets test on the old age pension and other benefits where the government can get away with being far more intrusive than it can with taxation. Good luck with getting the government to bring in an in-effect assets tax. You'll need it. "I also don't know how much revenue reform of income tax as Chris suggests would bring in." I know there was $6.5 billion of net rental losses claimed in 2009-09 so this would perhaps have represented about $2 billion of lost tax revenue. This is an enormous loss for no real benefit. Perhaps the only way the government might recoup some of this one day is by disqualifying landlords from the old age pension through the assets test. Also, you can probably calculate revenue changes caused by rate variations from the ATOs Taxation Statistics. There is one table that gives individual percentile values for taxable income, tax and number of taxpayers. Chris - just quickly - I get the figure of $10 billion at the URL below where it's stated full removal of dividend imputation would 'free up' $20 billion. Probably more now. "I get the figure of $10 billion at the URL below where it's stated full removal of dividend imputation would 'free up' $20 billion." It just shows that only a small fraction of this flows directly through to individuals. That $20 billion is probably the gross value of all franking credits and would include, for example, franking credits paid by companies from franking credits they received from their shareholdings in other companies. The net value obtainable from abolishing imputation would be far less than $20 billion, not to mention the loss to small investors through their super funds. "Lateral Economics has told the Henry Review that axing dividend imputation would free up $20 billion a year, enough to fund a cut in Australia's corporate tax rate from 30 per cent to 19 per cent." And I still say losses to small investors could be dealt with via a means test; especially if the above quote is true. It's a very significant amount of money. And if you dispute these figures what do think the real figure would be instead? And what do you base that on? I think this whole debate needs to be seen in a wider context - the shift of wealth to the owners of capital over the last 30 years as a response to declining or stagnating profit rates. That shift has involved a multi-pronged attack, including using taxes as part of that redistributive mechanism to the rich. A look at this year's Treasury Tax Expenditures Statement 2010 shows that the tax system gives disguised grants worth tens of billions to the owners of capital and the well off. The carbon tax fits into that - it is a GST on carbon whose main effect is precisely to cut the consumption of working class people. Talk of compensation is a furphy - the compensation won't cover fully the cost of the tax on average workers. A tax on the profits of the polluters, and strict price controls preventing them passing on the impact, and a concerted spending program on renewable energy and retraining at full wages, would be a start. That grand vision of environmental spending could in fact be funded by taxing economic rents - what Rudd and Swan called super profits. These profits arise form monopoly situations, or situations where there is a lessening of market competition. Such taxes on resources alone, according to Treasury, would have bought in $12 billion a year. Extending it to the super profits of all monopolies and oligopolies - the banks and supermarkets come to mind - would increase that to perhaps $20 billion. (I admit that is a guess). It would make no adverse impact on investment and jobs since all you are taxing is returns over and above that necessary to get capital to invest. Between 2006 and 2008 40% of big business paid no income tax and that figure looks like it has increased since then, with the Commissioner of Taxation expressing real concern about the business tax gap - the difference between the economic returns to capital and the tax they are contributing. While profits are going up tax paid is going down. Perhaps if the Gillard Government had any guts it might be taking action to tax big business seven a little. but since its is capital's cat's-paw it won't do that. Instead it will attempt to cut company tax rates. The pathetic little MRRT, like the slightly less pathetic RSPT, was an attempt to distribute value (value that workers create) from a super profitable section of capital to those less profitable through tax cuts. The super co-contributions - about 3% of the proposed revenue - was a sop to give the impression of benefiting workers while really hiding the reality that the rent taxes the Labor governments were proposing were specifically designed to benefit capital as a whole. This is part of Labor's traditional role. As a party of the trade union bureaucracy - a bureaucracy separate from the working class - it can rule in the interests of all capital unlike its opponents, the Liberals, who are more beholden to particular interests. Actually the capitulation of Labor to the miners and the dumping of Rudd as a consequence shows that this historic role may be changing. Tax the rich. No to a carbon tax. Yes to a tax on the profits of the polluters and all of big business. Real programs to develop renewable energy. Green jobs now. Australian Broad Left Network -Members Welcome! INTERESTED IN SPONSORING THIS PAGE? Why Are Sole Parents Under Threat? 'Battlelines' - what’s Tony Abbott really about? Australia Day 2010 – Celebration AND Criticism the key for ‘moving forward together'.